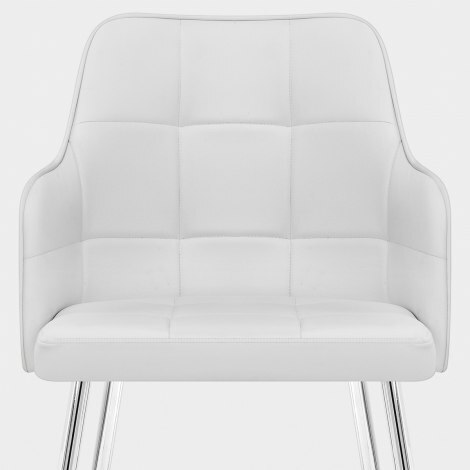 It's a new dawn for dinner times with the Dawn Dining Chair White. This fresh and funky design fuses encompassing style with sleek minimalism. A dining chair with the wow-factor, the Dawn is sure to be the start of something new in your dining area. The armchair-like faux-leather seat ergonomically curves, generously embracing all who sit upon it. Integrating beautifully panelled padding, the Dawn's stylish seat boasts impeccable standards of comfort. Four chrome legs supply the chair with a reliable base, fixing the Dawn at dining height and ensuring that it's as secure as it is sophisticated. With protective plugs on the feet to inhibit damage to flooring, you can rest assured is one furnishing that will leave you feeling good. "They are modern, stylish & comfortable & great value "
The chair was easy to put together and good quality. Very comfortable. Being used as a desk chair. Much better then I was anticipating given the price. very impressed by the quality of stitching and workmanship also very comfy and looks great. Lovely chairs...comfortable and great value.